Matteo Fargion, født 1961 i Milano, er komponist, utøver og lærer. Hans interesse for samarbeidsprosjekteter begynte på 1980-tallet, og siden da har han jobbet med utallige koreografer, teatre og utøvere over hele verden, blant annet Thomas Ostermeier, Claire Croize, Siobhan Davies og Andrea Spreafico. Sammen med Jonathan Burrows har han hittil produsert 11 duetter, som de to fortsatt turnerer med, samt ensembleprosjekter og et online filmprosjekt ved navn; 52 Portraits. Han jobber for tiden med på en opera med Mette Edvardsen. Matteo bor i London. 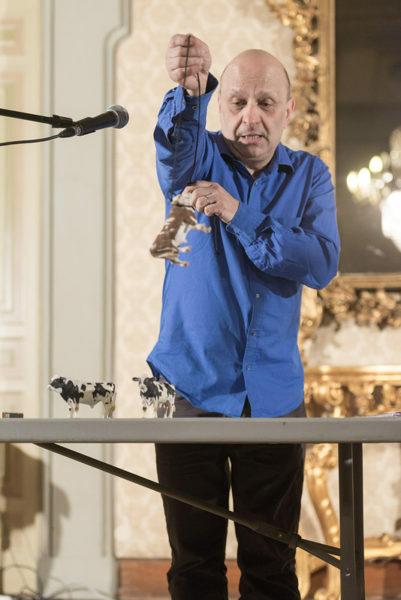 Matteo Fargion, born in 1961 in Milan, is a composer, performer and teacher. His interest in collaborative work began in the 1980s and since then he has worked with countless choreographers, theatres and performers all over the world, including Thomas Ostermeier, Claire Croize, Siobhan Davies and Andrea Spreafico. In a longstanding collaboration with Jonathan Burrows he has produced 11 duets, with which the two tour widely – as well as ensemble pieces and an online film project named 52 Portraits. He is currently working on an opera with Mette Edvardsen. Matteo lives in London.